The weekend. The ideal time to wonder around the city and visit the wonderful artisan stores that can be found out there. One of my favorite stores in Ghent, my home town is run by Joost Arijs. 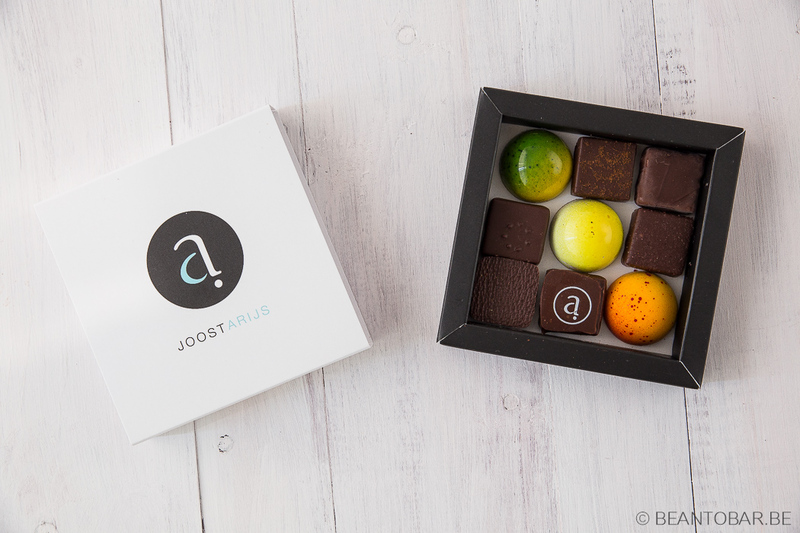 Joost is an inspired pastry chef who made his name in the Belgian gastronomy world, reaching the position of chef de patisserie at a 3 Michelin star restaurant, before opening his own business. Today he has two outlet shops, one in Ghent and one in Antwerp. Joost focuses on purity. He has a no nonsense approach with no over the top decorations or extreme flavor combinations. This is demonstrated when you enter his shop. Bright white and strict design embraces his collection. First you meet the pastry, followed by a mouth watering collection of macarons and delicate chocolates. In the back you have a view on the atelier where the products are created. I can’t hide it. My wife and I are big fans of his macarons. They are delicate, very flavorful and made out of nothing but high quality ingredients. We just keep coming back for them. But when you love chocolate as much as I do, you know you at least have to try those creations as well. Filled chocolates tend to be very big and overly sweet here in Belgium. Cream and liquor filling, ganaches, you find them in all sorts. But they hardly ever ring my bell, as the flavors they bring are pretty direct and often a tad one dimensional. The creations of Joost look totally different. They are small and are obviously made with great care and attention for detail. The half spheres always caught my attention, but I choose a cross section of the collection for a good overview. I was a bit surprised to find out the person behind the counter was unable to answer my question on what type of chocolate they used. However, she graciously went to the atelier and one of the staff members informed me they use a different types of couverture made by Callebaut and Valrhona. I know there are only few chocolatiers who work with true single origin chocolate, but one would expect this phenomenon to be known in the gastronomy world. I’ve been informed by another chocolatier about this and he let me know it is often a question of the technical side of the chocolate. Callebaut and Valrhona offer chocolate that behaves exactly like you would expect them to. The bean-to-bar variants can differ quiet a bit in between them, making it easy for production mistakes when creating filled chocolate. The box I took home looks very spectacular. A white rectangular box with simple but stylish design offers a premium look. It is almost like you are holding a jewelery box. Slide out the inner part and nine little gems await you. This is how I experienced them during a tasting session. 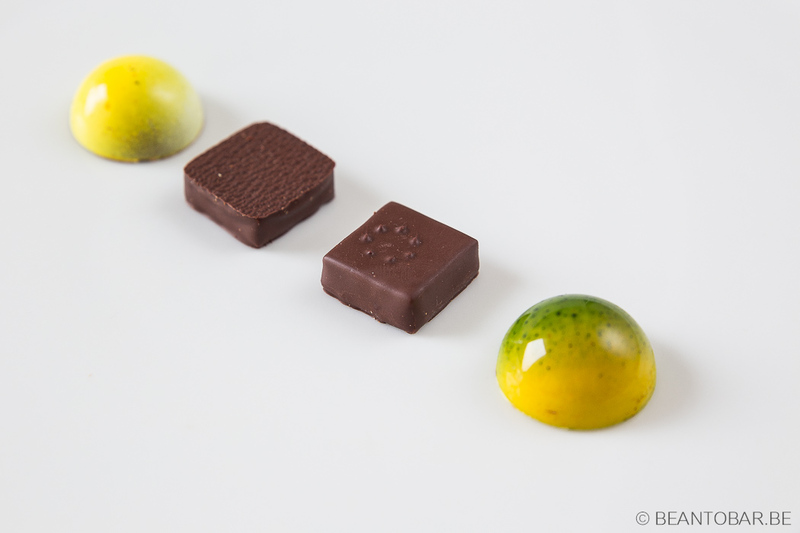 The yellow half sphere – glorious yuzu taste with an underlying spiciness – do I detect gingerbread/speculoos herbs? The flavor is then mellowed down by caramel tones of the milk chocolate used to enrobe the filling. What a wonderful experience it is when the filling is complemented by the enrobing chocolate. The yuzu flavor is powerful, but while it dissipates, the aromas of the chocolate cut through and create a flavor change. Nice. The one with the circle of dots – a sweet sour passion fruit filling rolls in your mouth and softly melts away. The chocolate enrobing only give a faint accent at the end of the melt. But it really are the fruit flavors you want to experience! The one with the wavy surface – slowly develops into a classic dark chocolate taste with a faint spiciness. Fades away to quickly. The one with the A – deep classic chocolate with a faint hint of vanilla. Reminds me of classic chocolate and doesn’t move me much. 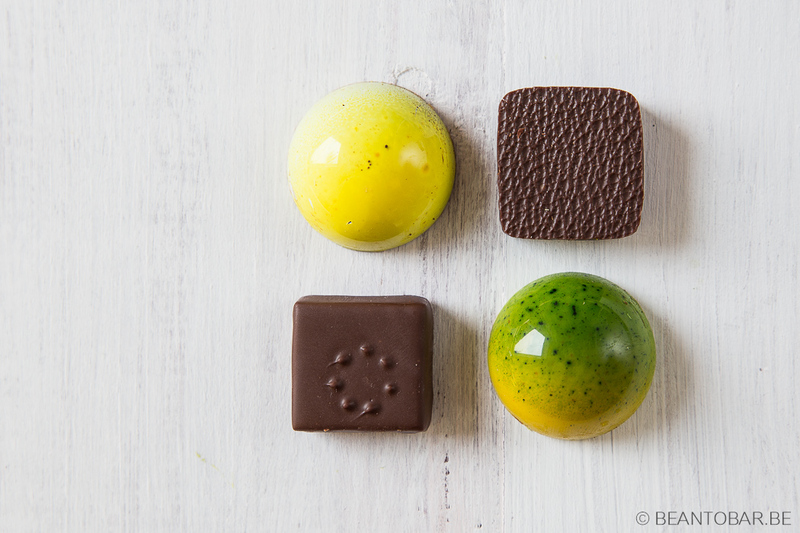 The red yellow sphere – soft and fresh orange aromas peak through sweeter white chocolate. A slight alcohol twinkle can be detected. It is quiet balanced and far from over sweet. After the tasting of the chocolate a nice mixture of ethereal orange aromas and white chocolate remains in the mouth. The one with brown dust – dark roasted coffee burns through in a dark chocolate ganache. The flavor is tempered once the filling melts away and the enrobing chocolate ads slight earthy, smoky aromas. The roasted tones remain after tasting, but don’t overpower the palate. The one with the dark dust – vibrant and sweet-sour raspberry flows richly over the palate. It reminds me of the glorious fruit flavors of Joost Arijs’ macarons. Just near the end of the melt, a darker tone emerges and the chocolate is revealed in the mix. But the real star is the raspberry here! The plain dark one – crunchy in the bite, it reveals a nicely toasted hazelnut flavor and note of brown sugar, with a pinch of salt surprising you. The chocolate enrobing is hardly noticeable as the filling runs away with all the attention. It leaves you with a caramelized aftertaste lingering on. The green sphere – once more delicate fruit flavors open up on the tongue. 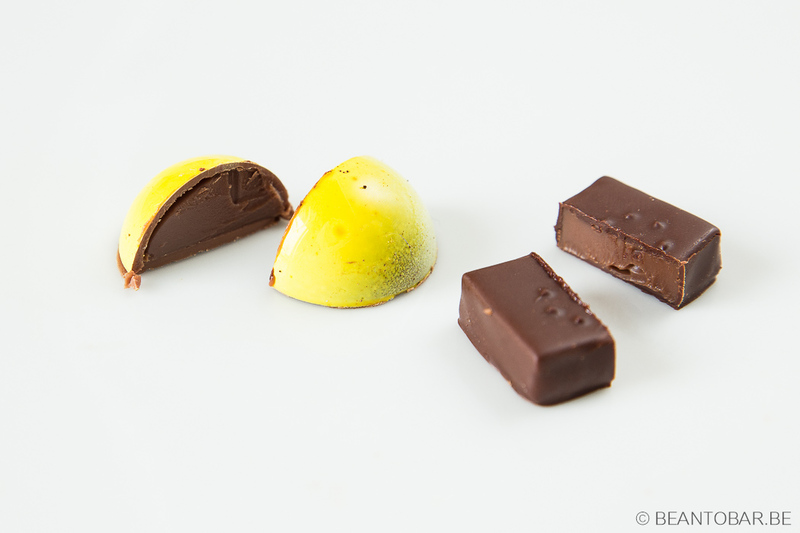 Not as assertive as in the yuzu one, but lemon clearly pops up in a sweeter milk chocolate ganache. When you pay more attention to the flavor developing, you realize there is a second note singing along with the citrus fruit. Preserved ginger created as smooth, harmonious flavor combined with the lemon. The white chocolate enrobing you are left with somewhat clashes with the fruity filling, as it lacks definition to stand out. So what to conclude. The chocolates variate from very classic to truly outstanding! 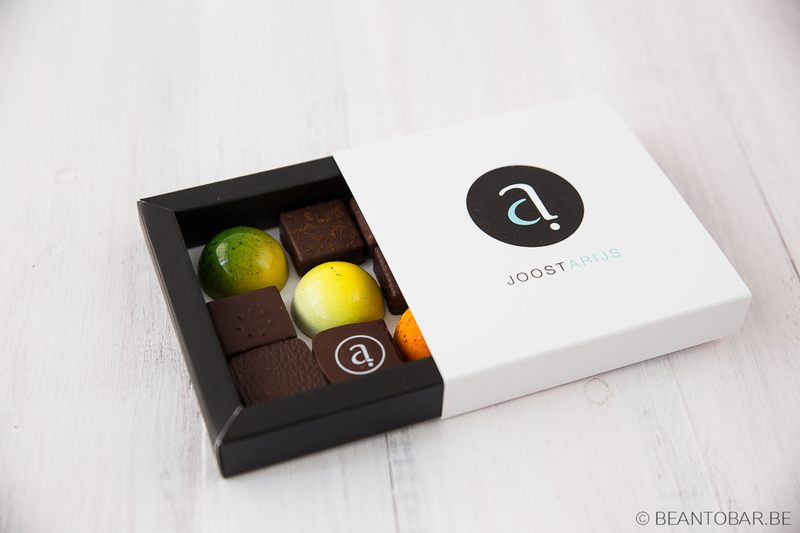 Especially when Joost works with fruit flavors, he is unsurpassed. They are vibrant and pure and are often perfectly combined with other aroma notes who bring the main theme to a higher level. The first yuzu chocolate is a prime example of this. The more classic variations have a harder time to catch my attention. You still feel the quality of the producer, but the flavor just doesn’t add that little twist to make things really interesting. But take it from me, make sure to try some of those fruity chocolates when you have the chance and you won’t be disappointed!